Situated in the county of Huairou, about 70 km northeast of Beijing, this section of the Great Wall connects the Juyongguan Pass in the west with the Gubeikou Gateway in the east. On being one of the best-conserved parts of the Great Wall, the Mutianyu section served as the northern barrier to defend the capital and imperial tombs. Work began on this section in the mid-6th century during the Qin Dynasty and is older than the part at Badaling. In the times of the Ming Dynasty, under the command of General Xu-Da, construction work on the current walls began over the earlier foundations, taking full advantage of the mass manufacture of quality bricks. In 1509, the Mutianyu section was rebuilt and is still in good condition today. 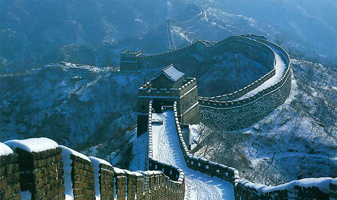 This section has the greatest construction scale and the best quality of all the sections of the Great Wall of China. Mainly built with granite, it is between 7 and 8 metres high and 4-5 metres wide. The Mutianyu section possesses unique characteristics in its construction if we compare it with the other sections: its 22 watchtowers and the associated steps are spread along the 2,250 metres of the section. The three most important watchtowers are the central one, which is the biggest, and the towers at each end of the section. Both the inner and outer walls of this part of the Great Wall have battlements so that the enemy could be easily attacked from both sides of the wall, a rather odd feature also found on other parts of the Great Wall. Today this section of the Great Wall is open to visitors.